For a special, once-off, mid-week concert, the Guy Buttery Trio takes to the Elizabeth Sneddon Theatre stage on October 10, 2018. 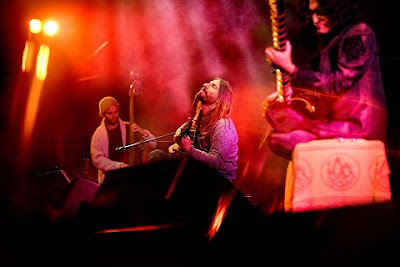 The collaboration consists of a collision of strings, with genius front man Guy Buttery on guitar, Indian born sitar player and vocalist Kanada Narahari and bass-player extraordinaire Shane Cooper on double bass. The three premiered two shows together to packed-out audiences at the 2018 National Arts Festival in Grahamstown in July. During this enchanting and captivating 70 minute experience, Buttery will swop out his guitar and pick up the mbira, the African thumb piano while Narahari’s emotive voice will complement the various instruments. Cooper will feature on both electric bass and double bass as well as a variety of live samples. Buttery continues to break the mould yet again his new music. His new Afro-Indian fusion sets up the perfect platform to take his intricate guitar-based compositions out of their solo guitar environment. He aims to re-contextualises these sounds bringing India even closer to its well-established home in South Africa. Both Cooper and Buttery are Standard Bank Young Artists Award recipients: with Cooper receiving the Young Artist for Jazz in 2013 and Buttery being acknowledged with the Young Artists for Music earlier this year. For the first time in the 40-year history - receiving this prestigious award as a non-classical artist. It has been almost two years since Buttery performed at the Elizabeth Sneddon Theatre on UKZN campus, having previously joined forces with The Odeion String Quartet in a sold out one-off performance. The Guy Buttery Trio appears at the Elizabeth Sneddon Theatre at 19h30 on October 10, 2018. Tickets R120 (R80 concessions). Booking is through Computicket.